Wrestling: There was a packed house at the Envision Financial Athletic Centre for Day 1 of the Western Canadian Age Class Wrestling Championships. The UNBC Timberwolves had to work overtime to overcome an outstanding performance by UFV’s Andrew Morris, edging the Cascades 97-93 on Friday evening in Prince George. Cascades fourth-year wing Morris exploded for a Canada West career-high 35 points on a red-hot shooting night (13-for-19 from the field, 5-for-6 from beyond the arc). But the host T-Wolves scored on nine of their 10 possessions in OT, racking up 18 points in the five-minute extra frame, and UFV was unable to keep up despite Morris’s heroics. The Cascades (5-12) and T-Wolves (9-10) renew hostilities on Saturday evening (7 p.m., CanadaWest.tv). The Cascades got off to a promising start, leading 26-19 at the end of the first quarter behind eight points apiece from Mark Johnson and Parm Bains. The T-Wolves found some traction in the second, and surged ahead 47-45 at the conclusion of a high-scoring opening half. UNBC reeled off a 7-0 run bridging the third and fourth quarters to build a 66-59 advantage, but five straight points from Morris followed by a Matt Cooley layup drew the Cascades even at 66-66. The T-Wolves pushed ahead once again, leading 77-72 after Vaggelis Loukas’s layup, but Morris came up big once again, hitting a pair of free throws followed by a triple on the next UFV possession to knot the score 77-77 with 56 seconds left in regulation. UNBC’s James Agyeman hit a tough pull-up jumper to put his team back in front, but Cooley tipped in a rare Morris miss to level the score and set the stage for OT. The two teams traded buckets early in the extra session, with Sukhman Sandhu’s triple giving UFV an 88-87 lead with 2:10 left. 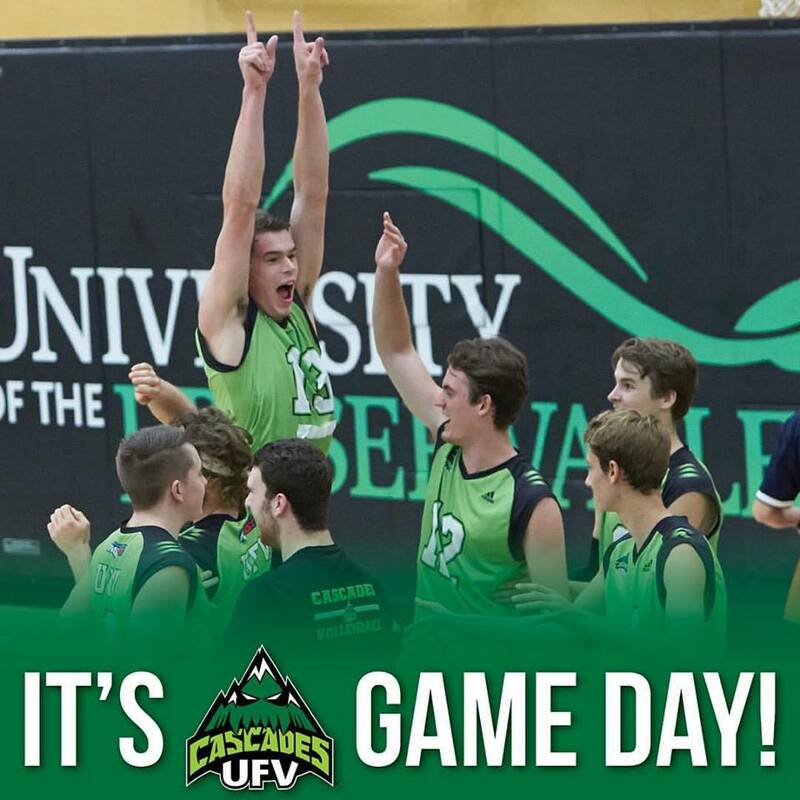 But the Cascades couldn’t come up with a big stop when they needed it – Vova Pluzhnikov’s and-one layup put UNBC up 94-90 in the final minute, and the T-Wolves went 3-for-4 from the foul line to seal the deal. Bains finished with 14 points for the Cascades, Cooley and Sandhu scored 11 apiece, and Johnson had 10. Johnson and Cooley each had eight rebounds to tie for team-high honours, and Canada West blocks leader Sandhu swatted four shots in his return to the lineup after missing four games due to injury. Pluzhnikov paced the T-Wolves with 26 points, and Agyeman and Jovan Leamy scored 18 apiece. UNBC’s ball security was outstanding – they had just four turnovers, to UFV’s 14. 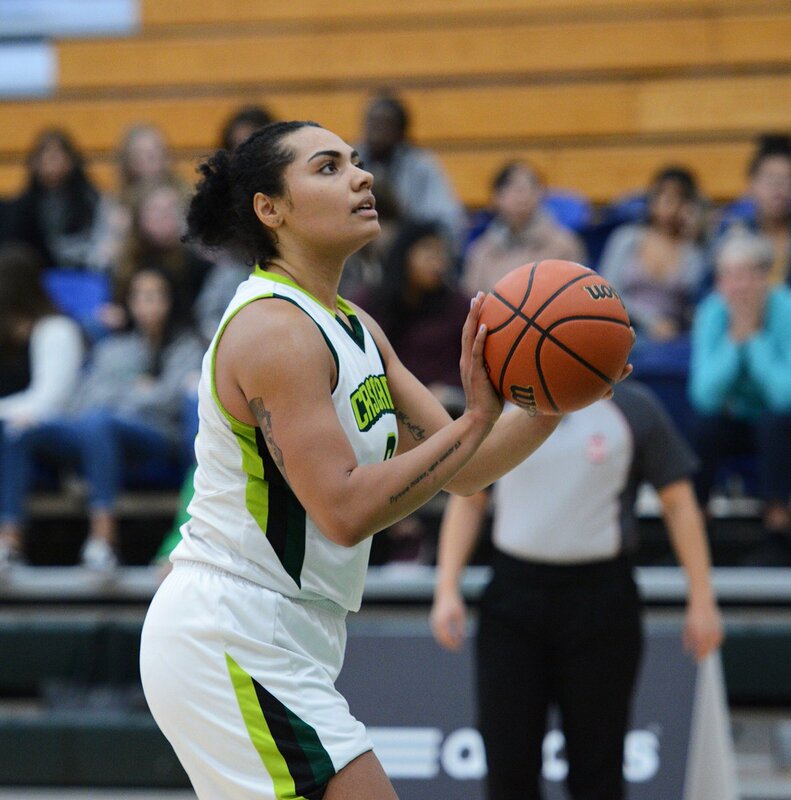 The University of the Fraser Valley women’s basketball team turned in its most impressive performance of the season on Friday evening, knocking off a tough UNBC Timberwolves squad 77-70 on the road in Prince George. Cascades senior forward Shayna Litman (25 points, 15 rebounds) and T-Wolves 6’4” centre Vasiliki Louka (21 points, 14 rebounds) engaged in a sensational head-to-head duel, but it was UFV’s balanced attack which was the difference. 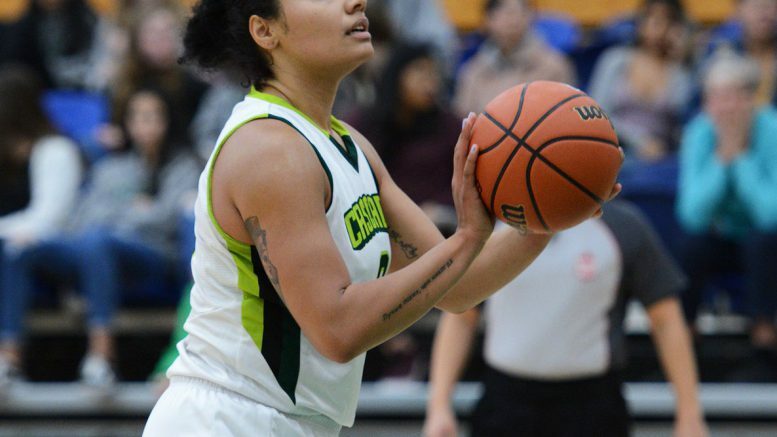 Four other Cascades – Sara Simovic (14 points), Victoria Jacobse (11), Taylor Claggett (11) and Amanda Thompson (10) – scored in double figures, and the visitors carved out a 42-32 edge on the boards against the taller UNBC squad. With the victory, the Cascades (7-10) took possession of a Canada West playoff spot, moving from 13th to 12th in the conference. They can clinch a post-season berth with a second straight win over UNBC (8-11) on Saturday (5 p.m., CanadaWest.tv). The Cascades were dialed in from the opening tip, racing out to an early 7-2 lead. The T-Wolves responded with a 16-6 run, but a triple from Alexis Worrell followed by a Claggett layup drew UFV back to within 20-18 at the end of the frame. UNBC led by as many as seven points late in the second quarter, but Simovic scored four quick points to cut the deficit to 35-33 at the break. The Cascades caught fire offensively in the third, racking up 27 points in the frame. Litman and Claggett did much of the damage early, and Jacobse drilled three-pointers on back-to-back possessions to help her team stake out a 60-53 lead heading to the fourth. UFV stretched the lead to 72-58 with Jacobse highlighting the surge with five straight points. She drained her third triple of the night, and followed with a steal and then pushed the ball down the floor to earn a pair of free throws. The T-Wolves weren’t done, though – this is a team that owns quality wins over the Regina Cougars (handing the current No. 2-ranked team in the nation its lone conference loss of the season on Nov. 17) and the UBC Thunderbirds (sweeping a pair of games Nov. 10-11). They fashioned an 11-0 run, capped by Madison Landry layup, to make it a one-possession game at 72-69 with 1:41 left in regulation. But after the two teams exchanged defensive stops, Thompson swished a huge triple, and Litman grabbed a defensive board on the next UNBC possession, absorbed a foul, and hit a pair of free throws to salt the game away. Maria Mongomo (16 points) and Landry (15) joined Louka as double-figure scorers for the T-Wolves. “Shayna stepped up to the challenge of defending Louka,” Tuchscherer said of Litman. “Matching her bucket for bucket and rebound for rebound, it was fun to watch. It was good to see her answer that challenge. Be the first to comment on "UFV Sports Friday – Basketball, Wrestling (VIDEO)"